Let’s admit it; it’s our tradition to lose the important stuff just before we need it. Be it the car or bike keys, wallet, or even our smartphone nowadays, we tend to forget every small thing we’ve last kept. It even happens with our TV remotes which would be searched around the whole drawing room and its tucked deep within the sofa only. Fortunately, Bluetooth tags were invented recently and are now helping every human with these misplacing tendencies. 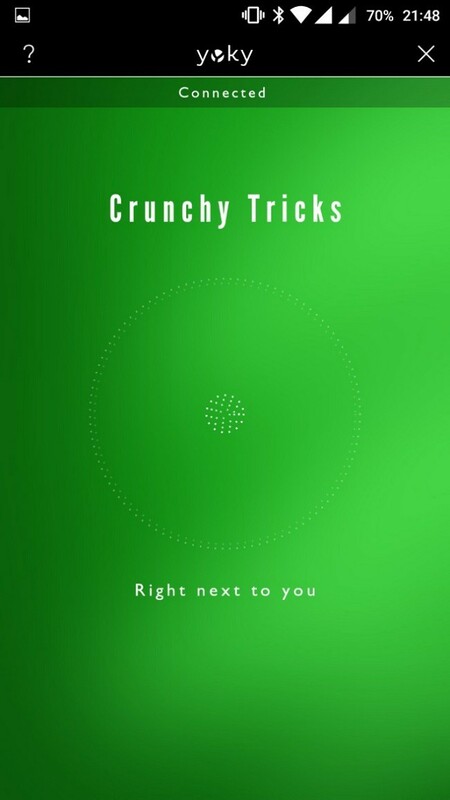 Last time on CrunchyTricks, we review one such great tag, TrackR Bravo and this time, we’re are back with yet another equally excellent device to help you out. 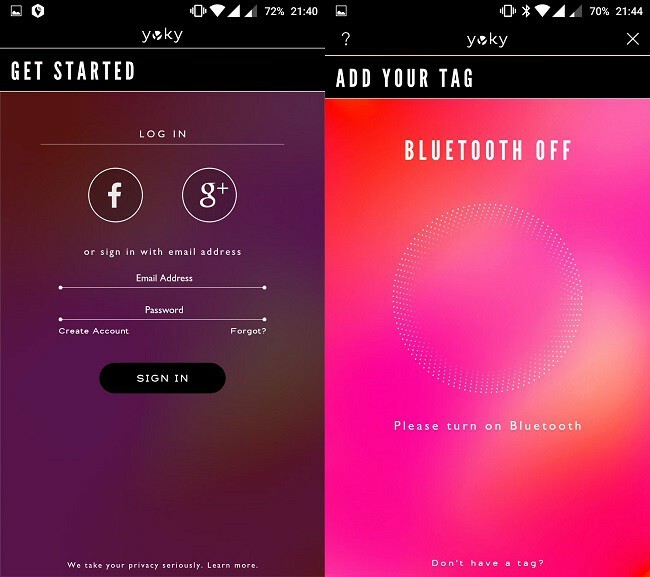 So, without any further talking, let’s start the review of Yoky Bluetooth Tag. Yoky is a set of products proudly designed and manufactured by an upcoming Indian Startup, Gina. Apart from the Bluetooth Tag, Yoky hosts few other cool products that can make your life simple from these little complications. You can get more information about the Yoky Tag on its official website. I received the package about 7-8 before, and the review is posted after a detailed inspection and testing of what this device is capable of. The box comes with the main Yoky Tag, a keyring and two double sided stickers or badges that can be used to attach the tag to your keys or whatever object you want to track. Apart from this, the company also provides a dog hook so you can keep track of your pet as well. Well, the Yoky tag doesn’t just start with a power button. You need to setup and connect the device to your smartphone. The Tag requires minimum Bluetooth 4.0 to connect. Also, you can control the tag with a dedicated Yoky App that is available for both Android & iOS devices. The Yoky App is available on the PlayStore and requires Android 4.3+ & on iTunes with compatibility for iOS 8+. Moreover, you can pair up to 8 tags with the app. It means that you are entitled to track your keys with a separate tag and other objects respectively. The Yoky Tag is a small square shaped tag that easily fits within your hands. The device is 8mm thick and weighs only 10g which makes it portable to attach it to your keys, wallet, etc. The tag comes with a replaceable battery which the company claims lasts up to 12-14 months. However, the battery life might vary depending on the usage of the phone. It is already mentioned that the usage of pedometer might reduce the battery life to 9 months. Talking about the usage, I’ve attached my tag with my bike keys which were naturally misplaced by me at least twice a day. Now, that I’ve attached the Yoky tag with it, I found it pretty reliable as the tag rings with enough volume to find the keys with the app. The device is also water resistant, so you don’t need to worry if you’ve attached it to your dog’s collar. You can easily track your pet with the last seen location on maps via the Yoky App. 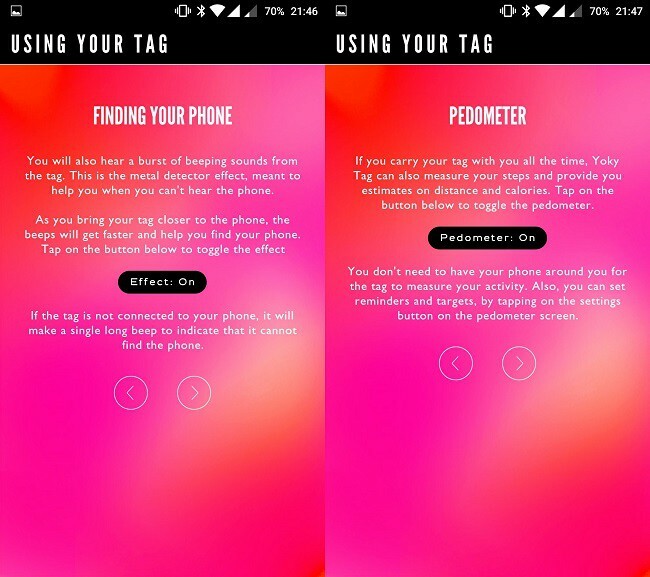 One of the most remarkable uses of the tag is to find your smartphone another way around. Just shake the tag thrice, and your smartphone would start to ring, if even on mute. Depending on the connection strength between the tag and your phone, the range is usually around 150 feet. The 3-axis accelerometer allows you to use your tag in the pedometer. Track your steps; calories burned and distance traveled via the Yoky App. The device is super affordable and costs you only 999 bucks per tag with fast shipment and delivery from the official Yoky E-Store. Moreover, you can get two devices for Rs 1799 & three Yoky tags for Rs 2399. It is a kind of interesting deal for combos, I guess. You can also purchase the tags from Amazon as well. The company offers different customization offers for your Yoky Tags. You are liberated to change the front and back stickers with various design variant and color combinations as displayed on the website. So, this was my hands-on review of Yoky Tag, a smart Bluetooth device to keep track of your personal belongings as well as your pets. The device is super cheap for all the features that it offers. An inbuilt pedometer, mobile ringer, and location sensor, what more do you need under 1000 bucks. Be sure to comment your thoughts and opinions on this cool piece of tech, and let me know if you’ve purchased one or not. Got any last-minute doubts? Comment down below! Cheers.